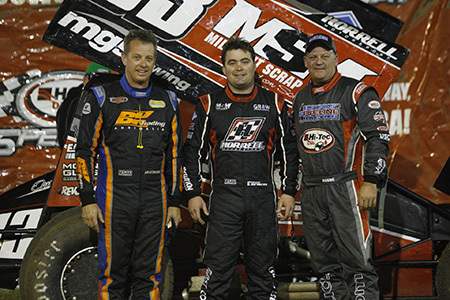 South Australian Steven Lines was victorious in the rain-delayed first round of the Ultimate Sprintcar Championship QLD at Hi-Tec Oils Toowoomba Speedway. In front of a huge crowd the Mount Gambier hard charger passed leader Robbie Farr with only three laps remaining and managed to hold on in dense lapped traffic for an historic win. Farr (who set Quick Time in qualifying at the start of the night) led every lap of the A-Main until Lines got by. Lines was naturally delighted with the win. The 30-lap A-Main was halted before a lap was recorded when Sydneysider Mick Saller and Queenslander Tony Wynne rolled over and brought on the red lights. At the restart Robbie Farr shot from third to first within two corners to lead down the back straight from Kratzmann and Lines before contact between Mark Pholi and Andrew Corbett saw the yellows come on with only one lap in the books. Farr sped off in the ECP Hi-Tec Oils #7 to lead from Kratzmann and Lines. Kratzmann showed plenty of speed and on several occasions had some aggressive and lingering looks at Farr’s lead position, only to fall into the clutches of Steven Lines himself with eleven laps remaining. Andrew Scheuerle and Lachlan McHugh had some spirited battles for a top four position before McHugh eventually moved ahead in his bid to reach a podium for the A-Main that honored his father Jamie as a Queensland legend. McHugh would come up one spot short in his bid to ‘meet Dad’ on the podium with Kratzmann holding on for third in one of his best drives outside last season’s maiden feature win. Farr looked to have yet another Toowoomba success sewn up but when the lapped cars became thicker and wider Lines closed within striking distance. Lines squeezed through a pack of cars to edge into the lead where he stayed until the checkered flags flew. DNF’s were Paul Rooks, Andrew Wright, Mark Pholi, Andrew Corbett, Mick Saller and Tony Wynne. Rodney Pammenter was a cool and calculating victor in the Modified Sedan winner ahead of Jason Beer in second place and David “Tangles” Head bringing home the big XF Falcon in third ahead of Nathan MacDonald fourth and Amy Evans fifth. Original Pole-sitter Aidan Raymond failed to materialize for the main event after mechanical issues reared their head after his final heat race whilst wild card Matty Smith and fellow front runner Wade McCarthy also had mechanical gremlins sideline them during the A-Main. Robert Mazzer put in a superb drive to score the Wingless Sprint A-Main victory from Michael Butcher in second place and Dave Eggins across the line in third. The Formula 500 A-Main victory went to Australian champion Liam Williams over Mitch Whittaker in second place and Kristin Brown home in third. Williams timed his run brilliantly to pass Whittaker with only two laps remaining and was never headed from there in the #A1. The next event at Hi-Tec Oils Toowoomba Speedway is Saturday night, October 6 for the second round of USC QLD – the 50-Lapper Sprintcar Rumble on the Mountain also featuring Formula 500’s, AMCA Nationals, V8 Dirt Modifieds, Modlites and Lightning Sprints.